Wonderful place to stay - Service is excellent - will most certainly come here every time I am in Erasmuskloof. Stayed one night. 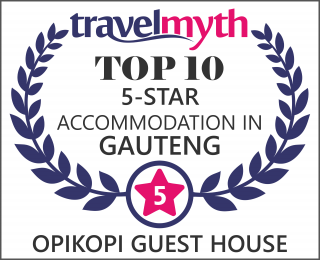 Simply the best Guest House in South Africa. Keep it up!!! I spend 13 nights in South Africa, and I can say without reservation that my one night in Opikopi was the absolute highlight in terms of accommodation. The room was beautiful, check in and out was more than efficient - it was pleasant and unobtrusive. The service we received was first class, and every little detail was perfect - our bags carried, our breakfast divine. The young lady that assisted with check in printed maps and assisted us with route planning for our onward journey - it was a pleasure to stay at Opikopi - and we will certainly return if we visit SA again. We loved your guesthouse and thought it is beautiful. We will definitely recommend it to everyone we know and will come and stay again whenever we come to Pretoria fro Limpopo! Thank you! The hospitality was over whelming, the atmosphere was very personal. The entire facility was beyond the standards. It was so good to feel to be welcomed. The service was excellent. I hope to return in the future. Ich danke Helen und Pieter. A sanctuary - thank you! Sonnyboy took great care of us at breakfast. Fabulous food. Wonderful days. Phenomenal service. A little place of peace! Baie dankie. Many thanks for a most enjoyable stay at your Guest House. The hospitality and friendliness were absolutely excellent and it was indeed a great pleasure to stay here. Unfortunately the Rugby did not go very well, but if we ever get another chance to follow the Lions to Pretoria again, we would love to be your guests. Many thanks again. Just a quick note to thank you all for the most wonderful weekend in Pretoria, especially to Claudette and Sonnyboy, who we did not get the chance to thank on Sunday before we left. It was a most enjoyable visit, and your hospitality will be appreciated whenever we recall our great trip. We arrived back safely in Dublin yesterday afternoon, very tired, but in extremely good spirits after a wonderful weekend in your Country. We are only here for one night, but I wish it was longer. This place is beautiful completely opposite to Pretoria. WOOOOOOOOOOOOO GO ITALY!!!! !